Elaine Hancock (Olney, United States) on 27 August 2012 in Miscellaneous. 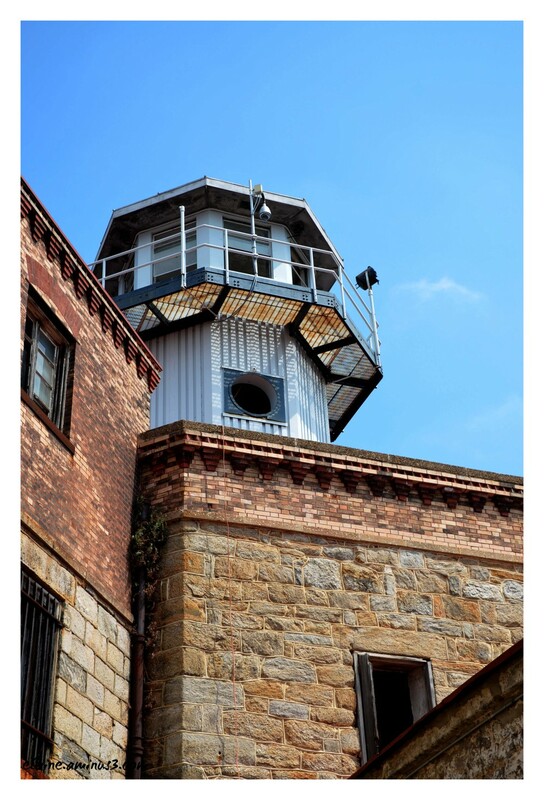 The prison is currently a National Historic Landmark and serves as a museum. quel minaret et out sueprbe cadrage de cette prison avec le beua ciel. I just love the stones used for this - all different colors and shapes. Makes the structure look way too beautiful to be a prison. Great perspective and shot! Superb angle to create this dramatic sense of history! The old prison looks in very good shape. These heritage places are worth documenting, but in many cases are depressing to visit. Your shot is excellent with the textures and detail in the buildings with the guard tower looming up into the sky. Well done. A fabulous angle for this shot. I love the shapes and textures in the architecture. Great perspective for the shapes, angles and warm textures ~ fantastic! Looks imposing. :) Nice capture with all the different shades of color in the bricks. I like you prospective. A super photo Elaine, great color & texture on the assorted bricks. The light really makes it stand out against that beautiful blue sky. Very nice!